With 3 AC sockets + 4 USB outlets, this Smart Power Strip Surge Protector can handle a combined wattage of up to 2000W to power most of your home appliances. And 1 overload switch to protect the device, it's easy to cut power for a complete shutdown when not in use to conserve energy. Idle for home, office or travel. 3. Configure Smart Wi-Fi outlet preferences on the "Smart Life" App. Note: Please keep in mind that the "Smart Life" App should be set up first before setting up the Alexa device, please also refer to user manual for more detailed steps. NOTE: FOR YOUR SAFETY, PLEASE DO ENSURE THAT THE LOAD POWER NOT EXCEED THE RATED POWER. 【Work with Alexa & Google】Sync with the Amazon Alexa and Google Home for voice control after connecting successfully. 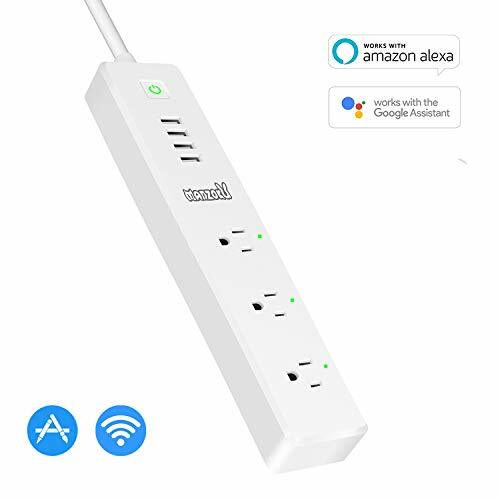 The WiFi smart power strip works with any Wi-Fi router without the need for a separate hub or paid subscription service. Support 2.4GHz WiFi network, does not support 5.0GHz. 【Setting Schedule】You can set up an automated on-off schedule on the Smart Life App, equivalent to place a timer outlet switch into this WiFi smart power strip, helps to turn on/off your lights or other household appliances based on specific time you set on the socket. Enjoy a cup of coffee automatically in the morning, remote control lights off at night. 【Multi Smart Outlets】Equipped with 3 AC Outlets, 4 USB ports and 6ft long extension cord, meet your daily need. You can remote control 3 sockets individually with your your iPhone, Android phone or tablet, but the 4 USB charging ports can only be controlled together. 【High Efficiency】USB super charging Ports with a MAX power output of 5V/4.0A, the surge protector detects your devices to deliver the ideal charging speed up to 2.4A per port, eliminating any power adapter. 【Ultra-safety Guarantee】FCC, RoSH, CE Certified. 100% Premium Copper Wire. Built in leakage, overload protection switch, product support Surge Protection, effective absorption of the sudden huge energy, protect the connection equipment from damage. 12-month worry-free warranty and friendly customer service. If you have any questions about this product by MANZOKU, contact us by completing and submitting the form below. If you are looking for a specif part number, please include it with your message.